We are very excited to have released our newest televised public service announcement in Hanoi on May 24th. It will be aired throughout Vietnam and confront parents with the realities of what they are risking when they do not put a helmet on their child. This project is very important to us and we invite you to watch the PSA, post it on Facebook, consider donating, and spread the word about the importance of child helmet use! On Wednesday, June 13th, online donations to AIP Foundation through Global Giving will be matched at 40% as part of a Bonus Day. Donate to AIP Foundation's "Give a Vietnamese Child a Helmet; Save a Life" project on that day and see your donation go further towards putting helmets on children's heads. To donate, go to www.globalgiving.org/projects/one-helmet-one-life beginning at 12:01am EST on the 13th. The matching will continue that day until the matching funds run out, so don't wait until the end of the day to donate! We also hope you'll help us spread the word, as further bonus funding will be given to organizations that raise the most money on Bonus Day. You can click on the project link and share the project on Facebook or Twitter, making sure to explain why this cause is important to you. Thanks for your support! To sign up to receive a reminder email about the bonus day on June 13th, click here. Policy & Donor Forum in New York marks first year of Decade progress - The 2012 Decade of Action Policy & Donor Forum, held in New York City on May 2nd, reviewed progress in the first year of the UN's decade-long campaign to drive down road traffic casualties. The Mayor of New York City, Hon. Michael R. Bloomberg has today received the inaugural Prince Michael Decade of Action Award in recognition of his leadership and philanthropy in global road traffic injury prevention. The award has been established to recognize major contributions to the United Nations Decade of Action for Road Safety 2011-2020. A Country Manager has been hired to run AIP Foundation's newest road safety project in Chengdu, China. 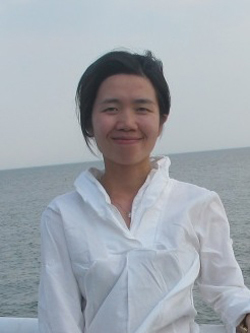 Xiaoyan Xu was previously working at Greenpeace as a campaign manager and has extensive experience working in Sichuan province. This project is being sponsored by Chevron. Helmets intentionally misused in Vietnam - Several vendors have been selling very low quality helmets for a cheap price and justifying this activity by including a small stamp that says "For walking or playing sports". A fifth grade student of Ha Huy Giap School and his mother were recently injured when a bus hit their motorcycle on their way to school. While 80 percent of these students are driven to school on motorcycles, fewer than 9.8 percent wear helmets daily. As a result, Long Huei, the Taiwanese manufacturer of the popular Andes helmet brand, has decided to donate helmets to this school as a way of supporting AIP Foundation's child helmet use campaign. 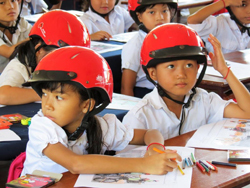 The students and teachers of Ha Huy Giap School received 1,505 helmets on May 7th. 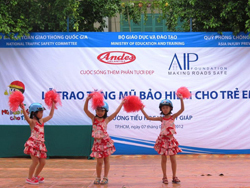 The American Center of the US embassy in Hanoi organized a Road Traffic Safety week with support from AIP Foundation. Conversations about road safety were facilitated, and the winners of a drawing competition received limited edition Protec helmets. 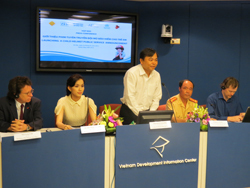 AIP Foundation attended the launching ceremony and gave a presentation on helmet wearing in Vietnam. A press conference was held in Hanoi to launch a new televised public service announcement (PSA) promoting child helmet use in Vietnam. "When I Grow Up" tells the story of a little girl who has a very bright future and a loving family. As the girl rides on the back of her father's motorcycle, she dreams of the person she will grow up to be. Suddenly, another vehicle crashes into theirs. The father, who is wearing a helmet, is left alone to face the devastating consequences of letting his daughter ride without one. The PSA is part of the campaign being implemented by AIP Foundation in coordination with the National Traffic Safety Committee, the Ministry of Education and Training, the Road and Rail Traffic Police Department, and being supported by the World Health Organization. Miss Universe Vietnam 2008 spoke as a Goodwill Ambassador. Watch the PSA in English, in Vietnamese, or with English subtitles. 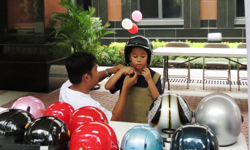 Johnson & Johnson's Helmets for Kids extracurricular activities were run this May. Parents are the final decision makers in purchasing helmets for their children. 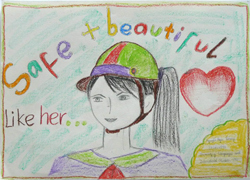 With this in mind, AIP Foundation created flyers detailing the 3 steps to correctly wearing a helmet and refuted common myths about child helmets that are prevalent in Vietnam. In Quang Binh, schools were given 3,100 flyers to distribute to their students' parents, in Ha Tinh 4,230 and in Dong Nai 2,020. 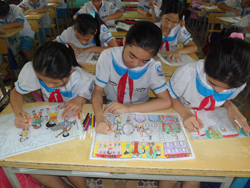 In addition, 9 schools in Ha Tinh organized a traffic safety drawing competition for their students. This is the first of several activities that will be run in the three target areas. Helmet enforcement lagging - The striking number of Cambodian motorbike drivers and passengers still travelling without a helmet is creating a significant public health issue that needs remedying, a new report shows. On the one year anniversary of the UN Decade of Action for Road Safety launch, ARRB Group sponsored a helmet donation to 800 students and 28 teachers of Phnom Dil Primary School. The helmets were handed over to the students at a ceremony attended by 200 people, including parents, local authorities, and partners. ARRB Group is one of Australia's most trusted advisors regarding road safety technical input. As their specialty is examining road and transport issues, they are very aware of the dangers that emerge from them. During the visit to Cambodia, their representative supported AIP Foundation in reviewing some existing school environments and assessed guidelines for improvement. AIP Foundation Cambodia was invited by the US Centers for Disease Control and Prevention (CDC) to demonstrate correct helmet use for the US Embassy of Cambodia's Safety and Security Day. The presentations included demonstrations and covered topics including helmet fitting and correct use, and road safety in Cambodia. Particularly emphasized was the recent CDC-sponsored Helmets for Kids program which provided 550 helmets to children in Kratie Province. While helmet use among students commuting to these schools on motorcycles was at 0% before the donations, the rates increased to between 80 and 100% after the donations. On May 30th and June 2nd, 2012, AIP Foundation joined the world community by celebrating International Children's Day. International Children's Day on June 1st celebrates children and their role in society, but the day also highlights the vulnerability of children. For this reason, AIP Foundation chose this occasion to equip the children from Hun Sen Chak Angre and York Batr primary schools with life saving skills and knowledge about road safety and safe helmet use. Students participated in safety themed activities in the school courtyard. These included a painting contest, a bicycle race, practicing crossing the street on a crosswalk set up in the playground, and a quiz of road safety questions, among other games. Thailand's government seeks to get a head start on improving road safety - Motorbikes are ubiquitous in Thailand, but helmets are not. Activists aim to tackle a problem that claims thousands of lives. On May 4th, AIP Foundation led the first Steering Committee Meeting for the Thailand Helmet Vaccine Initiative (THVI) at the Department of Disaster Prevention and Mitigation offices. Approximately 20 representatives from various organizations attended the meeting, including one of AIP Foundation's sponsors, Green Spot Company Limited. The draft THVI proposal and action plan were discussed and two provincial authority representatives presented their ideas for participation in THVI. The Initiative plans to launch its programs in Ayutthaya province soon. 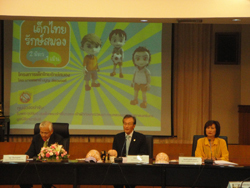 The Department of Disaster Prevention and Mitigation held a press conference entitled "Mind Thai Kids' Brains", on the importance of children wearing helmets on motorcycles. Journalists from leading Thai television stations and newspapers attended the conference which was chaired by the Secretary to the Minister of Interior, Ms. Padung Limcharoenrat. AIP Foundation Thailand's Country Director presented our role in promoting helmet wearing in Thailand.